Once upon a time, I used to create hair buns using elastic bands, but I have decided to ditch them for most of my styling needs. They’ll still be used to section my hair or hold the ends of my hair in place for certain styles…but for these updos? Nah, son. I’m done. Much love for The Puff Cuff! It’s becoming my go-to styling tool for updos! At first, I was doubtful. But since I learned about this product from someone I deem trustworthy, even though we’re not well acquainted, I was more inclined to take a chance on this styling tool. So I opted for the family pack. It includes four versions of the Puff Cuff. The four sizes are the Original, Junior, Mini and Micro. This style was created using one Junior and one Mini. I also use Eco Styler gel with coconut oil and a detangling brush. Once styled, I spritzed a lightweight shea sunflower finishing sheen onto my hair. 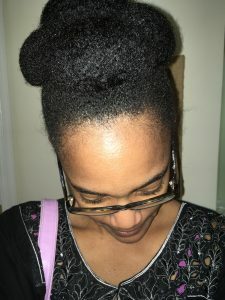 This styling tool has won my heart because I can wear a cute updo without using elastic bands, and the Cuff doesn’t generate headaches!